I am using another quote from that free calendar I picked up at St. Vinnie's. The image was also some free ephemera, advertising an art fair in the next town. I love the image but the artist who drew it was not mentioned. Thanks for stopping by and do some art today! That is a great sentiment to use and so true. Thanks for sharing. I hope your snuggled in for the snow and cold coming. Crossing my fingers it isn't bad. This one is gorgeous...that little sun 'got' me in!!! My lot have a name for their 'boy to be'....but won't tell me!!! Exciting times ahead for both of us with the little babies coming along. LOVE babies!!! Got off track there, didn't I?? LOL!!! 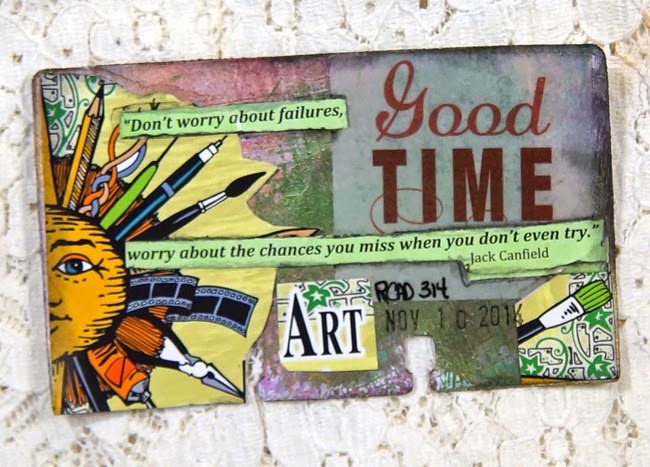 well this quote does suit mixed media and art journaling. we do try so much and in the end it's never a real failure..or is it. Love the card.